Well helloooooooooooooo, North Little Rock! Now I'm happy too! There are many, many, cool people in the world. Oddly (or perhaps not so oddly), a disproportionate number of them seem to be YA novelists. But my Hero Sandwich of the Day Award goes to none other than Maureen Johnson. Maureen, as I'm sure you know, is the smart, wry, and heart-tugging author of THE KEY TO THE GOLDEN FIREBIRD, THE BERMUDEZ TRIANGLE, and 13 LITTLE BLUE ENVELOPES. Must-read books all. Plus she's a fine human bean and mucho glamorous too, as you can see from her picture at right. Maureen has a great website and keeps a fabulous blog in which she vents freely and wittily about a wide range of subjects. Including, today, the Hernando Ban-do! Maureen “Nancy Drew” Johnson has done her homework, however. In true girl-sleuth style, she's uncovered heretofore unknown facts, inside scoop, and yes, shocking visuals that lay the mind-bending machinations of the Hernando County School Board bare as a baby's bottom! Anyway, you gotta go read what Maureen found out. Check out her site & her great books, too. I think you’re ADORABLE too! "This book is adorable. ADORABLE." and then sensibly uses all-caps to to denote the HIGH LEVEL of her ENTHUSIASM! Just like Super-Kitten Jess does in the book! 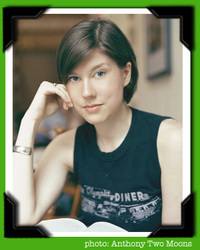 "Fans of Georgia Nicholson will appreciate Felicia’s creative and original slang, though she is much less snarky and negative. The characters (major and minor) are smart and likable and fun. They are all very motivated within their respective interests: Felicia (poetry), Matthew (breeder of genius rabbits), Kat (violin), Jacob (sitar), Jess (EVERYTHING, and with lots of ENTHUSIASM and capital letters -- she seems to have rubbed off on me), Randall (martial arts). They attend a super-alterna-hippie school, but unlike the beastly pretentious characters in Blue Bloods, no one even MENTIONS David Foster Wallace. There are, however, references to Medea and Edwin Booth as well as an explanation of the scientific method and many, many donut-fueled math study sessions. ADORABLE, I tell you! ADORABLE." “Sweet and Hilarious” in Buffalo! Win Valuable Prizes from BookBurger! Oooh, I just saw that BookBurger is giving away the audiobook of FLY ON THE WALL, the high-larious and VERY informative new book by my chum E. Lockhart. Go sign up for their newsletter and you might win! E. also gives the Burgerflippers one of her usual witty interviews, so it's definitely worth a visit. ...Ideally, if parents and teens read some of these books together, it could jump start some of these difficult conversations. Unfortunately, these are conversations we often put off until it's too late. Read his whole column and let me know what you think. Did a teen novel ever help you deal with a real-life issue? Have you ever discussed a book with one of your parents as a way of bringing up something that was hard to talk about? Would you want to? “The 10 books in question would not be required reading. The books merely would be available for check-out from the library. Moreover, the library in question is in a high school filled with teenagers who are racing toward adulthood. Certainly, some students, as well as their parents, would be offended by the salty language and sometimes unseemly scenarios in these books, as well as others not on the current hit list. If that is the case, they should not read them.